After what has been a long winter for many of us, the colours and vegetation of Arizona help warm us up a little bit as we move into Spring. Welcome to May's issue of Whispers, the newsletter of the Dereila Nature Inn - your cyber nature centre. This month marks the start of our third year of newsletters. Our first issue went out way back in May 2007. You can browse all of the previous newsletters by clicking here. In this issue we have lots of new additions at the Inn to tell you about. 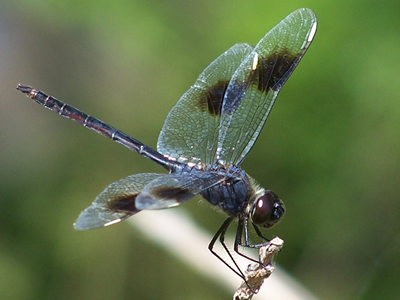 They feature birds, butterflies, special places and fungi. We also have trivia, photos and lots of other things we hope you'll enjoy. Thanks for supporting this project! 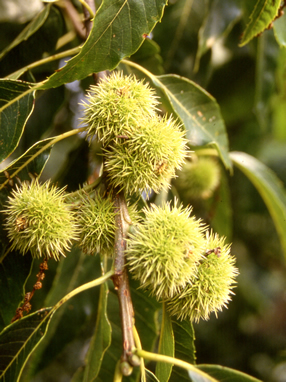 How did the Horse Chestnut tree get its name? This month's new additions include pages featuring something for everyone. Just click on the images to visit the page. We've added two more pages to this series of virtual visits to some of the most amazing places. Birds have eyes in all sorts of different sizes and colours. Here's a look at some of that variety. Once you've studied the different bird eyes from the Comparing Bird Eyes page above, you might want to try this quiz. Ducks feed in two ways: by tipping over and dabbling or by diving. In these two features meet some of the different ducks in these two groups. Only a few American states and no Canadian provinces have official butterflies, but on this page you can see some of the stunning beauties that have been selected. 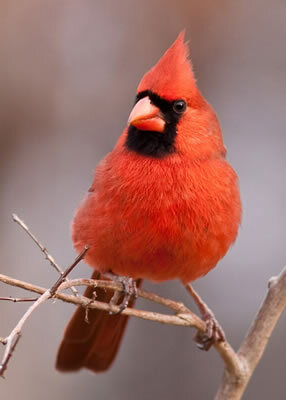 Judy Howle of Columbus MI has helped us with images for numerous pages at the Inn and sent in these wonderful pictures of male and female cardinals for us all to enjoy this month. We'll feature a few more of Judy's super photographs in a later newsletter. Lois Stacey, of North Augusta, South Carolina. 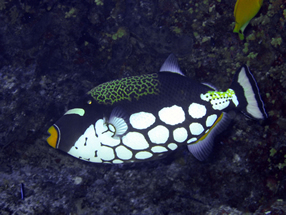 These colourful underwater images, a Spotfin Lion fish (left) and a Clown Triggerfish were submitted by one of our regular contributors, Dr Rob Walker of Victoria BC. 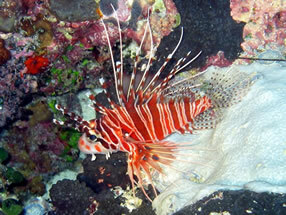 They were taken in the islands of Palau, located east of the Philippines. Many thanks to Judy, Rob and Lois for these fantastic pictures! We really appreciate your contributions. With new growth everywhere, this is a wonderful time of the year to wander about with your camera. 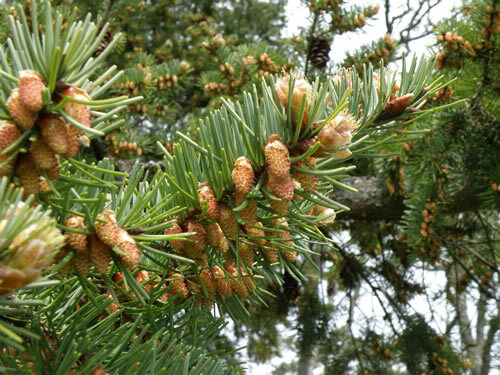 Pine cones are fascinating to watch develop - of course you'll need several weeks or months! This photo is of numerous cones in their early stages of development. We'll try and check back later in the year to give you an update on their progress. 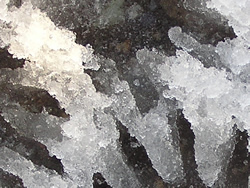 Our snippet this month features an unusual rock and water formation. 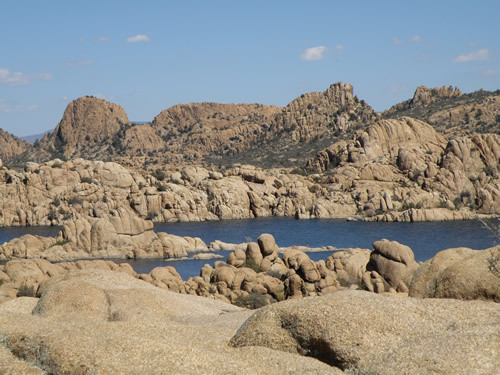 This is Watson Lake Park in Prescott, Arizona, with its interesting boulders of granite which are fittingly called Granite Dells. Erosion has given them a strange, lumpy appearance which creates a fascinating and news scene. Once again we invite you to submit a funny caption to go with one of the images in our "Caption This!" collection. 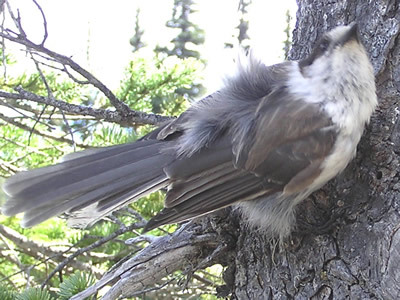 This month we wonder what this Canada Jay was thinking. We had a couple of suggestions, but perhaps you can think of something really funny. Number one: "Anyone have a comb or feather brush?" Number two: "They said she was a good hairdresser." To help avoid confusion when it comes to the names of living things, scientists have given everything a scientific name, which is often referred to as a "Latin name." 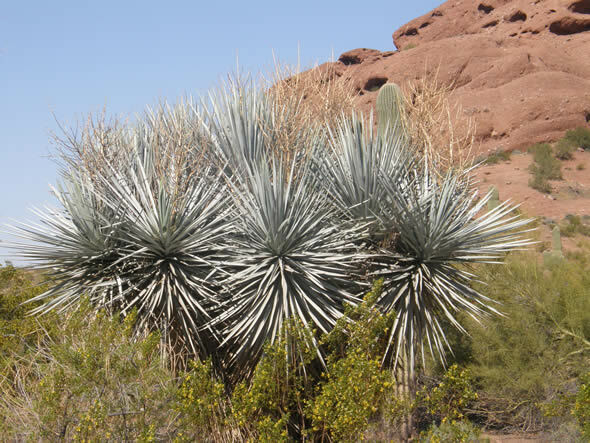 Most frequently you see the last two parts of the name which specify the genus and the species within the genus. The genus is considered to be a large group of organisms with similar characteristics. The genus name is always capitalized; the species name isn't. This is a Fairyslipper, Calypso bulbosa. Calypso comes from Greek meaning "to hide or conceal" it refers to the fact this this flower likes to grown in hidden spots in the forest. Bulbosa comes from Latin "bulbus" meaning bulb and refers to the fact that it grows from a bulb-like corm, which is an under-ground stem. Although most people use common names the Latin name can be very useful since many plants have different common names depending on region, tradition and even folklore. 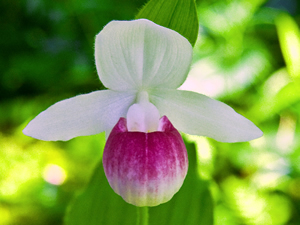 For example, the Fairyslipper is also referred to as Venus Slipper, Calypso Orchid, False Ladyslipper, Hider-of-the-North and Pink-slipper Orchid. 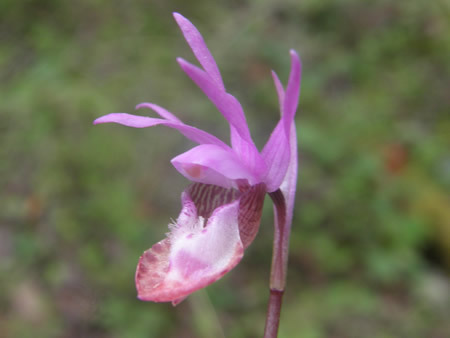 By using Calypso bulbosa with the common name we know exactly which flower is referred to. 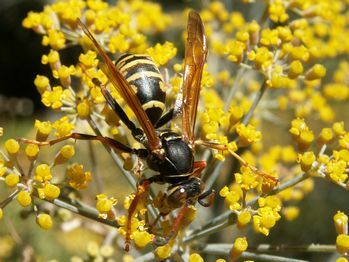 A man walked into a pet shop and asked the assistant how much his wasps were. The assistant replied, "We don't sell wasps." "But look!" the man pointed out. "You have one in the window." This wasp thinks this month's joke is hilarious! 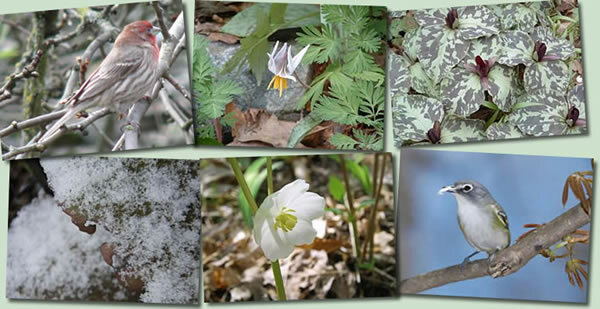 Earth Day was April 22 and we celebrated by inviting you to submit nature photos and you can see a selection of the ones we received in this collage. We had a great response and have compiled the photographs together on a special Earth Day Page. 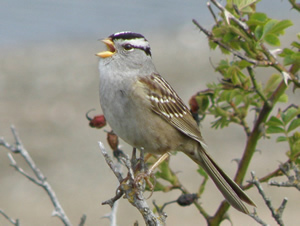 This White-throat Sparrow is chirping away about how great Earth Day was is one of the images we took to celebrate the day. We have received several more images of wildflowers for our provincial and state wildflower page including this one of a Lady's Slipper, flower of Prince Edward Island, which was sent in by Margaret Straley, of Spencer, WV . Thanks for your help, Margaret. 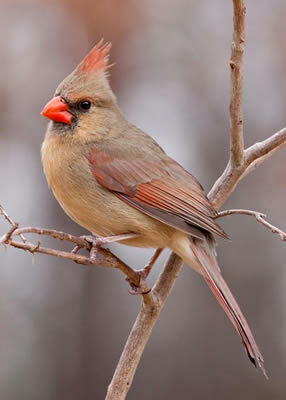 Be sure to keep those water bowls and dishes full of fresh, clean water - the birds just love them! 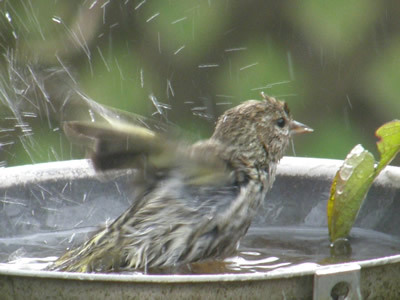 This Pine Siskin drops by to enjoy the water all year long. You can now add a gadget to your iGoogle hompage featuring images from our website. It's colourful, free and easy. For more information visit the Inn's Add a Google Gadget page. If you'd like to offer a financial donation to the Dereila Nature Inn project you can do so by clicking on the Pay Pal logo on the main home page or site map. Your donation helps pay for the webspace and Internet expenses. Thanks for your support! Our next issue will be in your inbox during the first week of June. Until then we hope you'll enjoy many wonderful moments in nature. It's believed that the Horse Chestnut tree got its name because of the early use of its fruit, the chestnuts, as a medicine for horses. 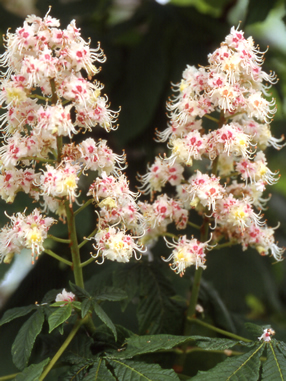 Pictured here are the fruits and flowers of the Horse Chestnut Tree. 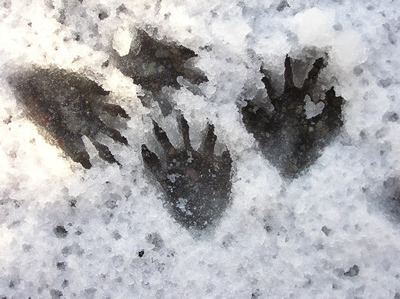 If you guessed "tracks in the snow," then very good! If you guess "Racoon track" - EXCELLENT! We thought the name Whispers well represented the things we love so much in natural world around us: the sounds and changes in nature carried by the wind; the subtle passing of the seasons; the calming serenity of a wildflower garden and the gentle quietness of the forest. Next time you're in a special place in nature, listen to the whispers.